This is the time of year when old friends get together around the holidays. Asking friends what they would like to have accomplished for themselves and their lives by next Christmas always makes for the most interesting bar stool conversation. Two years later, I am typing a review of his dream fulfilled. Gra na Firinne (Love of Truth) is the title of the debut CD by Beannacht, the folk duo Johnston formed with his niece, Deirdre Forrest. Beannacht’s songs are intricate acoustic folk tapestries that envelope Forrest’s warm vocals. “Your love of truth is all that you need, your love of truth will set you free,” the duo sings on the chorus of the title track, an album standout. “Our sound is a blend of all of our influences,” says Johnston when asked to describe the group’s sound. 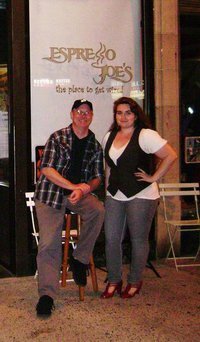 Within a few months of my initial conversation with Tom, he was playing coffee houses around the Garden State and building an audience. Deirdre would sing the melodies on traditional Irish songs while Tom would tweak them with American folk and blues flourishes. Deirdre would prod the addition of songs by Led Zeppelin, Adele, Florence and the Machine and Neco Case into the mix along the way. As their confidence grew with their audience, the duo began to write their own songs. Tracks like “Written on Both Sides” are driven by alt-rock chord structures and offbeat harmonies. “Roaming Knave” gallops without apology into Zeppelin’s classic Houses of the Holy, while “Lovin’ Ain’t Ever Wrong” has a hazy, lazy blues chord structure that produces a delicious humid sweat through your speakers. “You got a pocket for pretty words/I got a tune stuck in my head/that matches those pretty words that I haven’t said,” Forrest sings on “Quiet Desire,” the closing track. Accompanied by nothing more than a slow shuffle on a bodhran, she takes the listener back to the snug of an Irish pub by way of the Mississippi River. Johnston takes the microphone for a spin on “Better Angels of Our Nature,” a subtle yet pensive ballad about a couple trying to keep a relationship together. For Beannacht, the relationship has been smooth sailing despite the decades that exist between the players. I say to the audience, “You’re wondering what the old fart is doing with the young chick up here,’” jokes Johnston. Beannacht has won a number of awards among the Asbury Park musician community and have been building a steady following at Irish bars and festivals throughout the Garden State. With Gra Na Firinne, they will surely spread the “blessing” of their music to a much wider audience. Beannacht will host a CD release party to benefit Parents of Autistic Children at Atonement Lutheran Church in Asbury Park (308 First Avenue, corner of First Avenue and Heck Street) on Sunday, December 11 from 5-9 p.m. They will be joined by many special guests from the local community.